I somehow missed the publicity for the Third Leicester Big Eat restaurant promotion, but I usually try and give it a plug and I’m just in time. 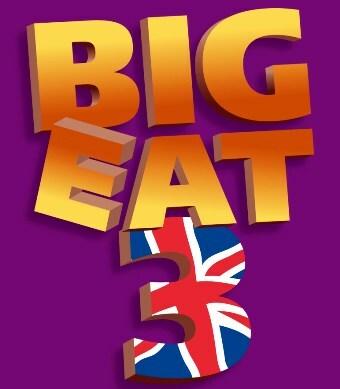 So Big Eat 3 takes place on Monday 2 July, nicely coinciding with arrival of the Olympic torch in Leicester. Anyone would think they planned these things. – 2 pizzas, two sides and a bottle of wine for £20 at the Rutland and Derby. 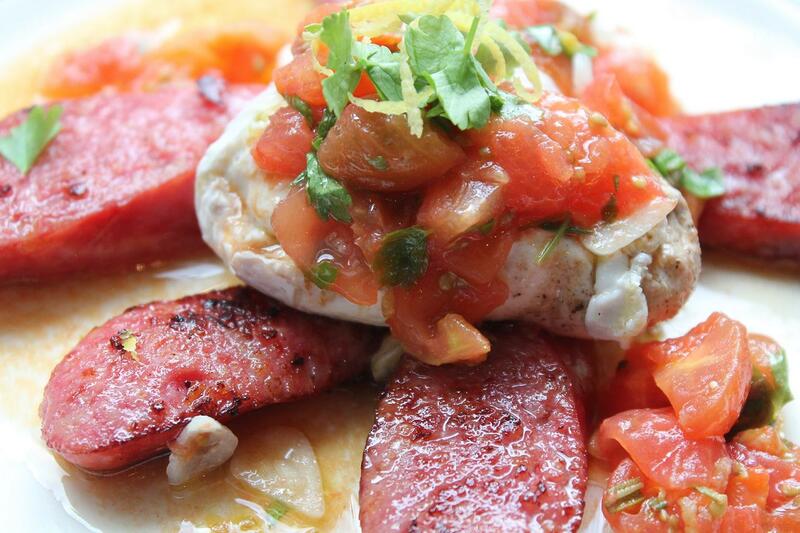 – 2 for 1 off a selected menu at Anjuna with “the latest Kizomba and Anjuna beats”. I’m off to Anjuna tonight as it happens. One last word – many of the offers require pre-booking and mentioning of the offer. Previous events have been very popular so check out the details and make your plans in advance. (Sorry for the late notice!). A couple of months back the Bistrot Pierre chain introduced an interesting little promotion whereby they would post a recipe of the month and encourage people to cook it, take a photo and email/tweet it back. Then they select one entry to win a free meal for up to four people. A little detail then. The toulouse sausages are from Archer’s on Queen’s Road, expensive but very lovely indeed. They are cooked in the oven for 15 minutes, then chilled in the fridge, sliced on an appealing diagonal and put in a hot pan for 2 minutes to colour before serving. The poached egg is a duck egg – they are that bit bigger and richer than chickens and not much more expensive. Maybe it’s psychological but they always feel more of a treat. My favoured way to poach is to tear of a sizable piece of cling film and put it loosely over a mug or glass to create a pocket. Add a little dash of oil, seasoning and maybe a preferred flavouring – a dash of balsamic or some finely chopped herbs. Then add the egg and carefully bring the sides of the film up together and tie little knot to create a sealed bag. This can then go straight into a saucepan of boiling water for about 3mins (or a bit longer for a large duck egg). It’s straightforward to then pull it out and cut the bag open – it peels off very easily. The warm tomato dressing was something of a treat. Peeled and diced tomatoes, mixed with lemon juice, olive oil, finely sliced, garlic, parsley, rosemary, salt and pepper. I added the lemon zest to beef it up. Then it’s just lightly warmed through – I found this kept all the flavours strong and distinct. It was lovely – I’ll definitely try this again. Oh and I’ve sent it in to Bistrot Pierre. Wish me luck – if I win I’ll report back. One of the nice things about being involved in some small way with the restaurant business is that the friends you make often end up opening new places and you get a great excuse to go and see them. I found out yesterday that fellow Great Food columnist, top photographer, blogger and inspired homecook Hazel Paterson has got herself a head chef’s job at Hollingshead in Melton Mowbray. On Thursday, Friday and Saturday nights she’ll be knocking out stylish dishes such as grilled peach and goat’s cheese salad with blackberry dressing, watercress, red onion, balsamic glaze and violet flowers or ballotine of free range chicken breast stuffed with wild mushrooms and garlic served with buttery mash and porcini sherry sauce . I hope to go over soon. 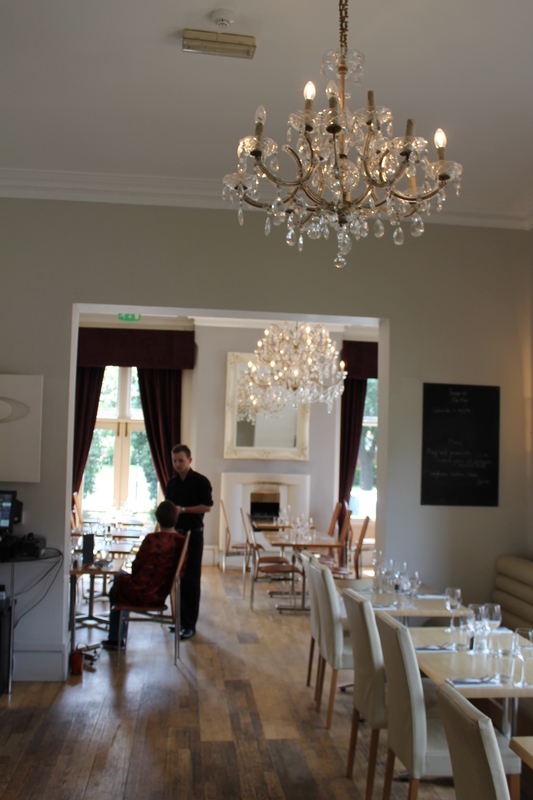 The modern brasserie approach of her menu is along similar lines to another friend’s venue that I was able to go and visit this very lunch time. Kerry Mathie has a good pedigree in the business having managed London restaurants for Anthony Worrall Thompson, made television programmes for the Food Network, and run the restaurant PR business Big Table. Late last year she took the plunge and opened her own venue – The Sanctuary in Upper Saxondale, just off the A46 between Nottingham and Newark. It’s a very sympathetically converted old Victorian asylum that several people have tried and failed to make a go 0f. But Kerry knows her stuff and has recruited a high quality team front and back of house.Crucially she knows how to promote and market a place too. It’s not a fine-dining, destination venue. 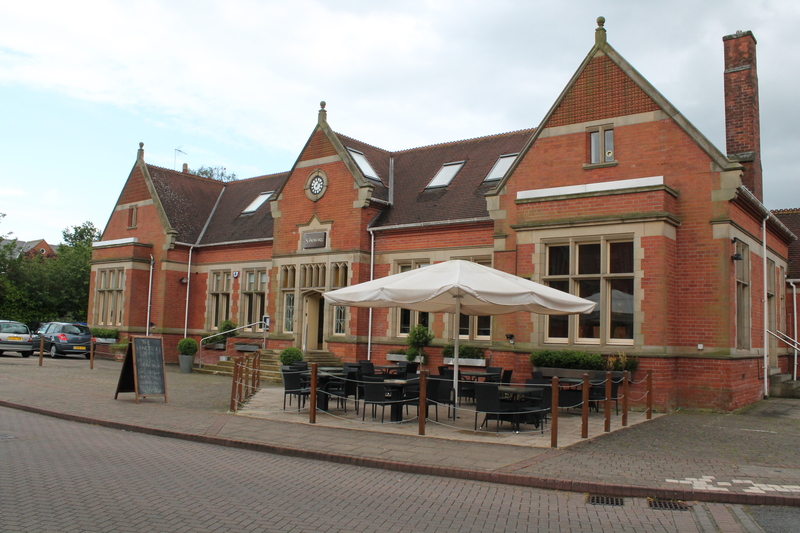 It’s a smart, stylish bar restaurant that looks after locals, engages with its community, but also draws in people from surrounding villages and the commuters moving up and down the nearby A52 and A46. Anway the food – I started with a light and airy stilton mousse, paired with figs given a wafer-thin brulee of sugar and a salad including a nice crunch from hazelnuts and acidity from mustard dressing. I had a nibble of Kerry’s ceaser salad – an authentic version of a much-debased dish. 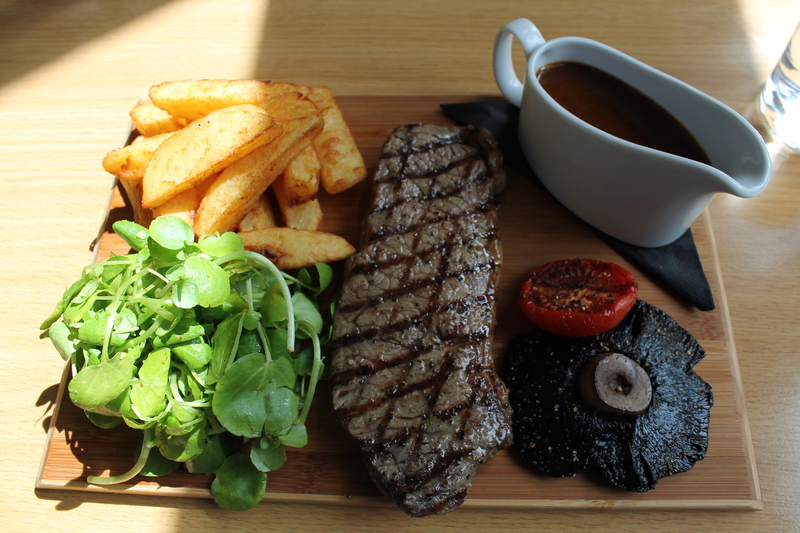 For main, I went for Derbyshire longhorn sirloin steak, and it was great. A classy cut, well-seasoned and cooked and beautifully presented with big fat hand-cut chips, field mushroom, grilled tomato, cress and a mild peppercorn sauce. It was precisely what you would hope for ordering this kind of dish at this kind of restaurant. Desert was a punchy parfait of strawberries and champagne from Southwell (err, that’s the strawberries, not the champagne). Throughly enjoyable food then in a stylish but far from intimidating setting, this is definitely worth a visit if you’re up that way. Well the rain came on the big day, but indominatable British spirit won the day and it appeared to be a big success. I’m talking of course about the Stoneygate Food Festival. So much rain, in fact, that the camera stayed in the bag. No pictures then, but the event is definitely worth a quick write up. Allandale Rd/Francis St has hosted the odd itinerant French or Italian market but this was something different. An attempt to get local producers and restaurants to highlight their produce. Fishmongers Nigel and Zoe Brady took the lead in setting it up, keen to reinforce the foodie credentials of these streets and worked hard to bring as a wide range of producers as possible. There were maybe a few holes in the offering but as a first stab this was a really good event that deserved better than pouring rain but as I suggested, it didn’t ruin it. You could have enjoyed really good street food from local restaurants Marchee Wok (the only Chinese takeaway I ever recommend), and city restaurants such as the Goan Anjuna and Maiyango, who had beautiful breads and patisserie. Head chef Phillip Sharp was also there cooking to order and I had a fantastic dish of scallops with samphire, pickled fennel and micro greens – a glorious combination and sweet, salty and sharp. The Brady’s sold out quickly of a huge paella dish and appeared to be doing a roaring trade in champagne too. It wasn’t a day for hanging round too long but there were queues at a number of stalls, I could see several stalls selling out and there was a general good feeling of everyone being up for good food. I would have liked to have seen more bread (I know you tried Nigel), maybe some cheeses, and a few new discoveries would have been good but I definitely had the feeling this was the first draft of a really good idea. Hope it happens again and I hope more businesses support it.